I thought, just for fun, we'd hop over and join Jenna and all her friends for 5 Favorites today! I know that I already shared with you some of my tried and true tips for finding used books for your home library. 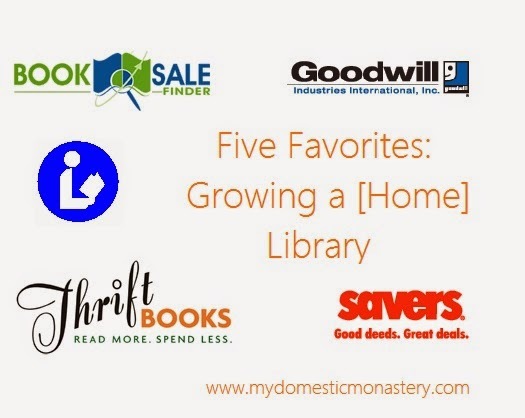 I've been in major home library building mode recently, and so I thought I'd share some more tips for you if you're hoping to grow your home library. New books can be pretty pricey, and having some ways to find good secondhand books helps alot. Savers is one of my favorite thrift stores to go to for books - especially children's books! I find their selection to be excellent, the prices reasonable, and if you sign up for their e-mail list you can find out about their sales when they have them. Books are rarely on sale, so when they are, you have to hurry over and take advantage of it! I know that I've shared Book Sale Finder with you before, but I'm sharing it again because...'tis the season for book sales!!! Be sure to sign up for their e-mail list, so you don't miss out on any sales! I've found some unexpected gems this way. Also, pay attention to whether or not they advertise a bag sale (a bag full of books for $5 or something like that) at the conclusion of the main sale. That's the BEST way to get bang for your buck! Thriftbooks is a newer find, and I actually haven't order from them yet, but they have FREE shipping and the prices seem incredibly reasonable. Look for sets of books or multiple books in one volume. I've seen entire sets for $4. Very, very reasonable. I'll have to try this site out (for the blog, of course) and let you know my thoughts once I do. Do you know where your local library is? Click here to find it. In my experience, libraries are almost always trying to get rid of some of their older or beaten up copies of books. Usually there will be a sale shelf tucked away somewhere, and the prices are usually as cheap as they come (often as little as a quarter or 50 cents a book!). Sometimes you'll even find a rack of free books they're discarding (our local library is doing that right now). Always worth looking through those racks! Craigslist has a whole section devoted to used books, but they also list garage and rummage sales. Rummage sales (especially church rummage sales) are one of the best places to buy books for super, super cheap! Garage sales can be good, but the selection is often really small. Now that it's garage/rummage sale season, keep your eye out for local sales and be to check them out. And don't forget...these sales often have bag sales, too!